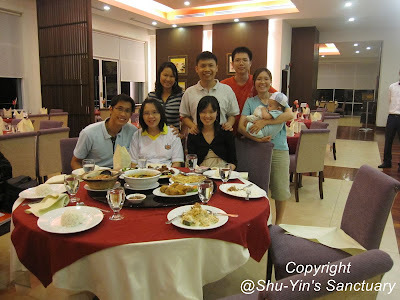 We met up last Friday at Penang Swimming Club as Daniel & family was back from KL for Shawn & Michelle's wedding. It was my first time to PSC's Chinese Restaurant since the reno. It was a pleasant dinner, with nice food and nice ambience. Price was reasonable too but I wish the portions were a lil bigger. 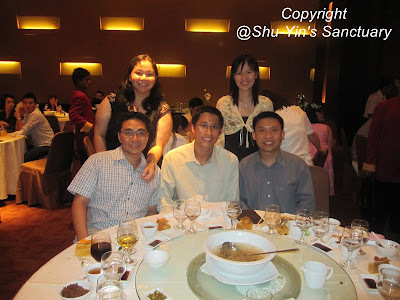 It was also probably the last time we got to see Siow Sen before she delivers. Her tummy is huge - anytime soon. Aiks..I look like I am also pregnant in below photo. 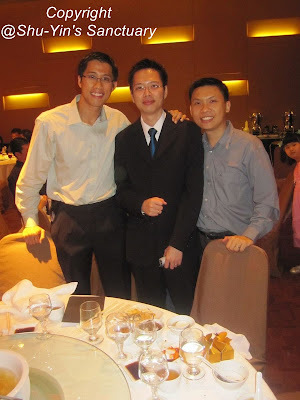 The following night, we had dinner at G-Hotel to attend Shawn & Michelle's wedding. Daniel was the MC, thus the coat. i must agree with you... you somehow look pregnant in the picture but in real life, your tummy is super FLAT! so don't worry, photos can sometimes be VERY misleading.